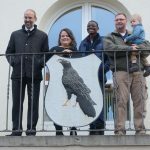 Kusterdingen is the largest of the five towns and the administrative headquarter of the Haerten area since 1975, when the five towns have been merged into one within a reorganization act of the state of Baden-Wuerttemberg. 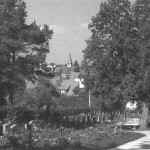 The town of Kusterdingen was first mentioned in 1142. Wolpoldo and Rainardus de Custordingen traveled to Jerusalem together with some Royalties. 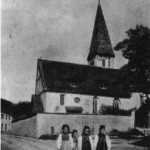 In the same year also the parish is mentioned the first time in ‘Sülichgau’. In 1447 the oldest family names were Jakob Wanndell, Hanns Rentz, Steffen and Hanns Wypraecht, Martin Gruwer, Ludwig Ott and Hensin Meiger. In 1484 Kusterdingen became a part of Wuerttemberg. In 1738 Caspar Nasel emigrated to Pennsylvania. Although so close the Kemmler from Wankheim never moved to Kusterdingen. Therefore Johann Georg Walker from Immenhausen, who married Margarethe Walker from Kusterdingen started the Kemmler line in Kusterdingen. His son Johann Georg Kemmler, born Feb 12, 1879 is the first Kemmler ever born in Kusterdingen. The Lutheran parish records are available locally, but they may not be accessible to the public. 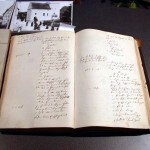 Copies of the books and registers have been microfilmed by the Wuerttembergische Evangelische Kirche and are also available via the Mormon church. Historical Society of the Haerten – Geschichtsverein Härten e.V. 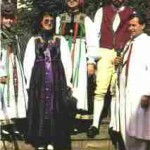 In 1999 the Geschichtsverein Härten e.V. 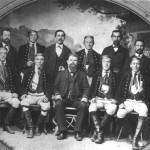 (Historical society of the Haerten) was founded. 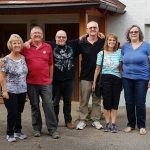 The basic objective of the club is the research of the history of the five towns on the Haerten and the preservation of art and cultural history. and are helping to gather new information. 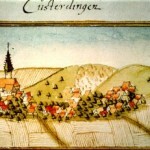 Painting of Kusterdingen 1683 © Geschichtsverein Haerten e.V. 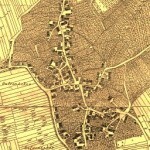 Old City Map of Kusterdingen © Geschichtsverein Haerten e.V. Who is the young man on the picture?